Roast up cauliflower with sweet onion and rosemary and you will gain a whole new love for this delicious, healthy veggie. Great for Thanksgiving or anytime you need a scrumptious side dish! I am having a serious, serious love affair with cauliflower lately. Up until now, my affection has expressed itself in soup form, from cauliflower blue cheese soup to cauliflower soup with lobster dumplings…it makes my heart go pitter-pat. But lately I’ve been realizing that simply roasting it with some aromatic fresh rosemary and a few onions is just as marvelous, and is going to make whatever that night’s entree is taste even better just by association with the wonder that is cauliflower. 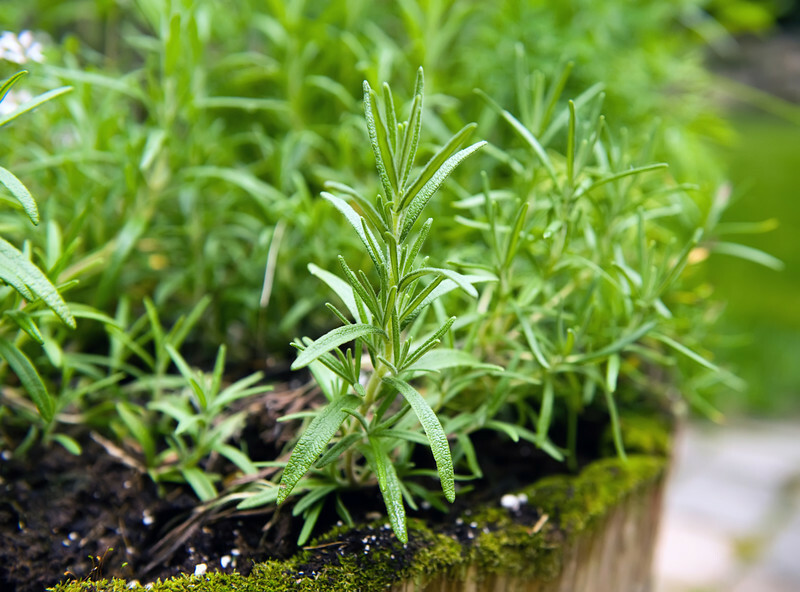 First of all, here’s a brief additional ode to fresh rosemary. I grow my herbs – basil, parsley, thyme, mint, tarragon, sage and rosemary – in big whiskey barrels outside my back door. From about late May through early October, I can pop outside and pick a bunch of whichever I need for whatever I am making. Then we get the first chilly night here in the Northeast, and the basil gives up the ghost immediately. Here one day and gone the next. After that, the tarragon and the mint start looking a little worse for wear. Roast up cauliflower with sweet onion and rosemary and you will gain a whole new love for this delicious, healthy veggie. Great for Thanksgiving or anytime you need a scrumptious side dish!Click to TweetThe thyme hangs in there, but gets all tough and woody. Yesterday the parsley, which had stayed with me bravely through November, finally keeled over. The sage…the sage is a puzzle. It grows bigger and bigger, but in a kind of intimidating way. It gets a little tough and overpowering. You’re scaring me a little, sage. But the rosemary? The rosemary is the winter wonder plant. It is thick and lush and fragrant and wonderful. And for some reason, the aroma reminds me of Christmas. Probably because the Southern husband once got me a rosemary plant shaped like a Christmas tree. Anyway, it’s out there in my whiskey barrel right now, just begging to be roasted with some cauliflower. All that you need to do with this recipe is get yourself a head of cauliflower, chop it up into florets, and then slice the florets, cut an onion or two into eighths and toss them both with some olive oil, salt and pepper. Now take a generous amount of rosemary and rub it between your palms to crush it a little and release the oils (bonus points – your hands are going to smell WONDERFUL). Put the cauliflower mixture on a foil-lined baking pan. Scatter the rosemary on top and pop the whole thing in the oven for about 45 minutes – you want the cauliflower brown and crispy along the edges. And that’s it! Serve it up and remember that cauliflower is modest but fantastic, especially in these chilly winter evenings. Happy cauliflower! Preheat oven to 425 and line a rimmed baking pan with foil. Toss cauliflower and onion gently with the olive oil. Add salt and pepper and toss again. Place cauliflower in a single layer on baking pan. Rub the rosemary between your palms to crush it, and then scatter on top of cauliflower. Roast for about 45 minutes, until the cauliflower is tender and turning deep brown along the edges. Serve at once. Rosemary definitely smells like Christmas to me also. I guess because it’s so pine-like? Eating it feels like Christmas too. Love this! I have a Costco bag of cauliflower in my fridge that I was trying to find a recipe for. I didn’t even start the search yet and ran into your recipe. Thanks! I’m in love with this recipe! Making it for the third time this evening- all hail the mighty cauliflower! !